Stand back a bit and scan the produce section of your grocery store. Ask your child to name the colors she sees. Green is probably most noticeable. Maybe there is some orange, red and yellow. How about blue? Ask your child to name all the bluish fruits and vegetables and the two of you can probably count them on one hand. What gives? Why is there so much green and so little blue? Let’s take a closer look at fruit and foliage to answer that question. Closer. Even closer. Closer still. All the way down to the molecular level. That is how close you have to look to see the pigments responsible for a plant’s color. Chlorophyll gives us green and carotene is orange. These pigments are particularly important to plant life . They are responsible for keeping the plant fed. Green vegetation uses the sun’s light in combination with chlorophyll to provide nutrients through a process known as photosynthesis, converting carbon dioxide (CO2) into sugar and oxygen (O2). In orange vegetation chlorophyll and carotene work together to help plants grow. Carotene also gathers energy from the sun which it then passes on to chlorophyll for use in food production. Does blue get in on this food factory? Well, no. Blue pigments don’t participate in photosynthesis. Anthocyanin is the name of the pigment molecule present in blue fruits and vegetables. Scientists are not exactly sure why we have blue vegetation. The color could safeguard against green-eating predators who shy away from the bizarre blue. Or the color might act as a shield protecting the plant from the sun. Anthocyanin absorbs Ultraviolet light. Some scientists believe that by absorbing this type of radiation from the sun the molecule protects the plant from cell damage (just as we apply sunscreen to serve the same purpose). The color may also act as a beacon to animals and insects. Attracting bees that pollinate the plants or animals that eat the plant’s fruit and spread the seeds as waste. Scientists do agree on one thing, foods containing anthocyanins are really good for us. They improve heart function, ward off cancer and reduce aging signs. 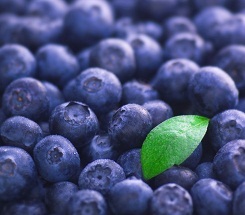 Eat blue fruits and vegetables by the bushel full. Don’t let their scarcity in the produce section – which, by the way, is a result of the complex chemistry required to make anthocyanin – discourage you. There is probably some anthocyanin containing produce you have yet to try like purple carrots and purple sweet potatoes. And you will be happy to know the pigment can be found in strawberries. Beverage manufacturers would like to produce a blue soda and the popularity of the natural food market has provoked them to make the dye out of a naturally occurring blue pigment. The experiment you have done with your children should prove that making a blue soda is a tricky prospect. The carbonation, and other ingredients in soda make it acidic. Talk about what color the blueberry extract turned when you added an acid (vinegar). What color did it turn when you added the base (baking soda)? Ask your child if he thinks a blue soda could be created using anthocyanin as a dye. Get into Spring, dye some eggs using natural food coloring. This video will show you how. Hope you enjoy exploring the chemistry of pigment molecules!